Why use high purity check valves from Parker Veriflo? Parker Veriflo produces the highest quality check valves for every application, including the best-selling and highly versatile F9 high purity check valve. In this blog, Fluid Controls explains the revolutionary technology behind the F9 series and why you should make them your valves of choice. What is a high purity check valve? Check valves are an extremely unique product because they are totally self-reliant and do not need to be adjusted regularly or maintained in order to do their job. The main focus of Parker’s check valve design is to allow the flow of a liquid or gas to travel one way but block it from travelling in the opposite direction. 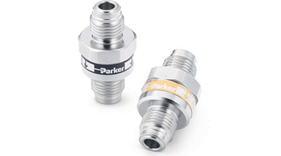 Parker check valves contain a seat, disc, cover and body. The opening and closing of the seat is entirely controlled by the media it is directing, making it versatile enough to suit many different industries. The Parker F9 Series of check valves is welded with highly resistant stainless steel and offers a purity level of up to 0.9 Cv. If your business operates within an industry that demands the highest levels of hygiene, then these high purity valves could be the products for you. The other advantage of these stainless steel check valves is that they have been electropolished to minimise the risk of corrosion damage. Plus, they also boast an asymmetric spring design that guarantees quiet operation. As well as their exceptionally high level of purity, Parker check valves take up a very modest amount of panel space due to their small footprint – giving you more room to work with. Furthermore, F9 Series check valves also contain two different kinds of seal materials, meaning they work smoothly alongside all semiconductor gases. This alone eliminates the need for several different kinds of high purity check valves, making the F9 Series highly cost-effective. For more information about the Parker Veriflo F9 Series check valve or to order yours today, please call us on 0118 9702060 or email fluid@fluidcontrols.co.uk. Which check valve type is best for your application?